Rashi points out the while planning his strategy, Yaakov devises 3 plans to ensure the survival of at least part of his entourage: gifts, prayer, and war. According to the commentator Nachalat Moshe, this particular order of tactics was to impress upon all future generations, that no matter what we do in life, what we wish to achieve in our lifetime, prayer is necessary both before and after the desire itself. 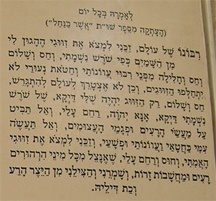 In Yaakov’s case, prayer for endurance and fortitude followed the giving of the gifts as well as preceding his least favored approach of war. Anything and everything that we long for must be accompanied by prayer, even those things that seem to occur by natural means. This, explains the Nachalat Moshe, is the reason that we mention the redemption, the Geula, just prior to the recitation of the Shmonei Esrei, which is the core of our prayers and supplications to Hashem. Despite the notion that the Geula will transpire systematically over time and in a natural fashion, we say: “go’el Yisrael,” just before the Shmonei Ersei. This reminds and connects us to the past redemption from Egyptian (Mitzraim”) exile and exhorts us to focus our minds on our total dependence on Hashem for our future deliverance. This applies likewise in the case of shidduchim. While many singles meet “naturally” at shul, weddings or parties, others meet through introductions by friends or matchmakers. No matter what the means, we must never forget the need for Hashem’s participation in the facilitation of such meetings and in opening our own “metzarim,” limitations, enabling us to see the suitability or lack of suitability of a particular potential soul mate. We need to speak to Hashem regularly as a child who is craving a new bike would speak to his Dad. We know that he has the power to provide us with that bike and we do not stop “nagging” him until we get it! Difficult as it is to accept, Hashem is waiting for us to “nag” him; more than anything, He wants a close relationship with us and longs for the deepest connection possible. Were he to provide us will all of our needs immediately, without delay, we would have no need to “be in touch.” But the more we want something, and the more urgently we request it, proving that we trust that He has the power, that Hashem is ultimately our loving Father, who wants us to have that which we so passionately crave (provided of course that it will promote our spiritual growth), He will respond positively! Keep the dialogue going with Hashem and He will certainly bring your bashert closer! I have attached the beautiful tefilla for a zivug that hangs in the Holy Me’arat Hamachpela, for all to recite in bringing about the discovery of their true soul mate. And may we all be zoche to pray and sing songs of praise and thanks afterwards as well!